I’ve been roasting and sampling quite a few coffees of late — certainly too many to write about all of them. There are however probably a couple worth mentioning — one of which is this beauty produced by a group of small farm-holders under the San Marcos name in the Huila region of Colombia. Huila (Spanish pronunciation: ˈwila) is one of the departments of Colombia, and is located in the southwest of the country, with Neiva its capital. Colombia’s second highest peak, the Nevado del Huila volcano, is located in the Huila department. The Magdalena River is Colombia’s largest river, and rises in the Huila department, with the river valley containing some of Huila’s most important towns. 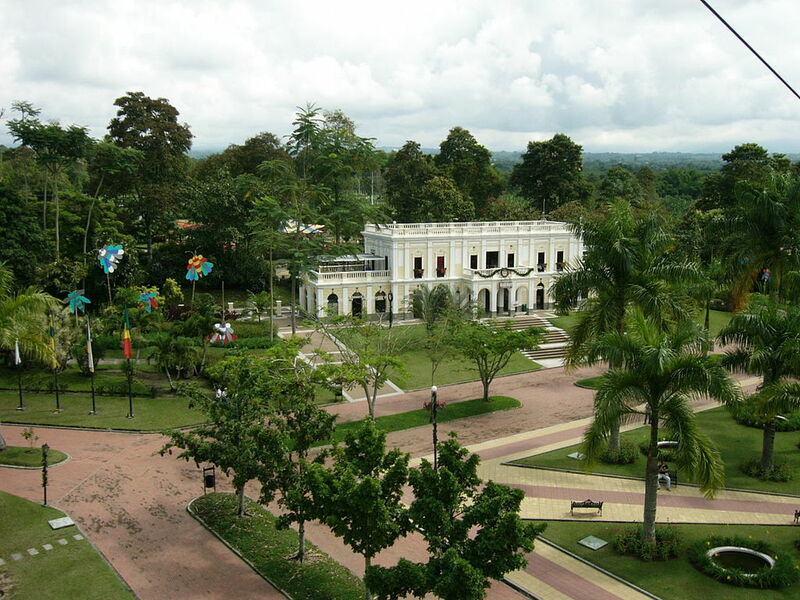 Of course much of the country has a strong heritage with its coffee growing regions, and nearby department Quindío houses the National Coffee Park. The National Coffee Park (Parque Nacional del Café) is a theme park located in the department of Quindío, Colombia, 4 km south-west of the town of Montenegro and 11 km west of the departmental capital city Armenia. The park can be reached from a cable car, offers attractions orchid animatronics colorful, global coffee garden, a roller coaster, food stalls based on coffee, Colombian folk architecture, and other attractions. Tasting notes: Balanced and clean, with bright orange acidity, intense sugarcane sweetness, and notes of milk chocolate, caramel, honey and marzipan and lingering sweet finish. The 30 small-holder farms under the San Marcos name, farm in the town of Timaná — located in the south of Huila, 180 km from the state’s capital Neiva, a prime location for growing high quality Colombian coffee. The San Marcos small-holders are members of the Association of Agricultural Producers of Timaná (Asprotimaná), who have helped this group find access to specialty markets for their exceptional coffee. Created by a small group of coffee growers in 2002 as a way to increase their bargaining power and achieve a better price for their coffee, currently the association has around 150 coffee producing members, who produce on average a total of 10,000 bags of green coffee annually. I often order in South American coffees with the expectation of fairly bold, full-bodied results in the brew. This offering from San Marcos in many ways achieved that, yet with exceptional balance and subtlety as well. Brewed in a V60 drip filter, the end result was an exceptionally creamy, medium bodied drink, with a smooth, lingering finish. The overall flavour profile I’d describe as choc-orange, however there were definitely notes of blackberry, honey and toffee in there as well. Whilst not as clean when brewed with the AeroPress, it was very well-balanced in the cup, displaying perhaps a little more of that toffee sweetness. It was enjoyed equally as well by my buds in our little office coffee collective as a start of the day pick me up. When brewed as Espresso, again, the combination of orange acidity, sweet toffee, and chocolate, made for a choc-orange bomb in a cup. A real winner on all counts. When combined with milk in a cappuccino or flat white, although a little more subtle, the sweetness of the milk and those choc-orange flavours presented a Jaffa milkshake of sorts. This offering from the small-holders of San Marcos is well worth trying, whether you’re a filter or espresso type, and will serve you equally well through either method. If – like me — you are both, then there is a treat in store with this superb Colombian. It looks as though there is still some available on the Ministry Grounds website (links above), and it would be advisable to get on over and order some, otherwise I might just snap up the rest.